The upcoming AAFP Board elections present a tremendous opportunity for the NCAFP. Your proven support of our association gives me confidence that you’ll consider this important call to action. As you are aware, Dr. Thomas Koinis, our current NCAFP Foundation President, is a candidate for the AAFP Board of Directors. His candidacy offers the NCAFP an excellent opportunity to influence AAFP policy at the national level, and to help direct our specialty at a very critical time. Should he be elected, Dr. Koinis will be able to communicate our region’s views on topics like tort reform, medical malpractice insurance, the Future of Family Medicine Project, and our growing reimbursement crisis. If elected, he arolina cademy will be a powerful resource for our association as Drs. Jones and Henley have been. Although the benefits are clear, election campaigns are bothof time-consuming and costly. I am personally asking for your financial Family Physicians proudly endorses the candidacy support. Your contribution will help our chapter offset campaign expenses – estimated this year at over $15,000 – and allow us to wage a very competitive effort leading up to balloting on October 2nd. It will insure that Dr. Koinis’s message will be heard by all AAFP delegates. His election will help us secure a strong voice on the AAFP Board through 2006. Your contribution and involvement is vital. To make your contribution, simply fax or mail the completed form below to Academy headquarters. The fax number is (919) 833-1801 or use the enclosed business reply envelope. I always appreciate your continued commitment and look forward to success in October. Thanks! Yes, I want to help Conrad Get Elected! North Carolina wants to continue to impact family medicine at the national level by helping to lead the AAFP. By contributing to Dr. Flick’s campaign, you help ensure that the NCAFP can conduct one of the best campaigns in the nation. To contribute, simply complete the form at right and return with your contribution to Academy offices. Insurance Committees. The legislation should be considered by the full House in the near future. The entire medical community has fought for this key piece of legislation, including the Academy, the NC Medical Society, the N.C. Medical Group Managers, several other specialty groups and the N.C. Hospital Association. Look for updates and alerts in NCAFPNotes. Gregory K. Griggs, MPA, CAE Executive Vice President Mr. Griggs has been on staff with the NCAFP since 2005 and is a member of the American Society of Association Executives (ASAE). He completed his undergraduate studies at UNC-Chapel Hill and his graduate training in association and non-profit management at North Carolina State University. He formerly served as CEO of the Henderson-Vance County Chamber of Commerce and as Executive Director of the Association Executives of North Carolina and the Filter Manufacturers Council. Married with two children, Greg is Past President of the Henderson Lions Club, a current active member of First United Methodist Church in Henderson, and serves the Boards of Directors of both Kerr-Vance Academy and Maria Parham Medical Center. Continuing Medical Education Meetings is holding steady, and the sense of physician involvement is maybe higher than ever. I want to take just a few moments to address that sense of involvement. On a recent Monday evening, 21 of your colleagues attended or called into a nearly three-hour meeting of your Chapter’s Advocacy Council. Now I can surmise there are many other things these family doctors could have been doing on a Monday evening. But they each decided to give up their time to support the profession of family medicine in North Carolina. While all of us expressed frustration with proposed Medicaid cuts, we also expressed enthusiasm for potential legislation that would require basic fairness provisions in all health care contracts between insurance companies and physicians. There was also a sense of commitment from past, current and future leaders of the Academy – a commitment to stay involved and ensure family medicine’s voice is heard loud and clear. As we have embarked on the Laser-Like Focus of our new strategic plan with a significant emphasis on advocacy, I’m heartened by the number of calls and e-mails our members have made regarding the state’s budget situation. It’s almost as if our membership has heard the call to arms. But the job is yet to be finished, and your help remains crucial. In summary, let me make a few simple statements. Your specialty – family medicine – stands proud and strong in North Carolina. But we need your help. To ensure that the future truly is the best of times, it is going to take the commitment of all 2,700 members of the NCAFP. You don’t necessarily have to give us your Monday night, but I urge you to take action when you receive an advocacy alert. Those e-mails, phone calls or even personal visits with a legislator make a world of difference when we try to influence policy on the state and national level. Here’s to the best of times! get involved, stay involved, educate you contacts, and get participation on as many commissions/ committees that your organization can. This will help you get your message out and to keep it in any discussions that will occur, as well as allowing you to take an active part in that discussion. You must also make sure that you have worked on your message to make sure it is the right message and that it is refined to be concise and easily understood. As a family physician in private practice, what efforts should be made to enhance the viability of family medicine as a business – both for urban, suburban and rural practices? Is enhanced payment the only answer or can physicians pursue other means? I think that enhanced payment is a key part, both in helping current practices, but more importantly, in attracting new bright medical students into our specialty to care for future generations and to keep health care as high quality and cost efficient. However, a good business practice is also very important and even the aspects of PCMH will not keep badly run practices solvent. Each practice must know our overhead, the costs to them to provide care, how to control those costs and run efficiently, and finally be able to competitively negotiate contracts - even if it means practices collaborating with others on some degree. be holding a special party on Friday, December 4th called ‘Wine, Dine & Chocolate Divine’ that will combine the NCAFP Foundation Silent Auction with other fun activities. Plus tours of the Biltmore Estate, golf, Biltmore Spa packages and the President’s Gala on Saturday night will also be offered. The official brochure will be mailed in the coming weeks. For complete information, please visit the Chapter’s website at http://www.ncafp. com/wfpw. The site contains the most up-todate information and even allows you to register. If you have specific questions, please contact NCAFP’s Kathryn Atkinson at (919) 833-2110 or via email at katkinson@ncafp.com. NCAFP to Offer Web-Based CME Program on Health Disparities Later this summer, the NCAFP expects to launch a new online CME program focusing on health disparities. The program will provide insights into the definition of health disparities, the causes and methods to address them. The speaker will define the Culturally and Linguistically Appropriate Services standards (CLAS) as outlined by the National Office of Minority Health. Also they will discuss how to use CLAS as a way to improve cultural competency and therefore reducing health disparities. Be on the lookout! students have participated in educational sessions to date. In December 2008, the NCAFP presented their Phase I results in a poster presentation at the NIH Summit on the Science of Eliminating Health Disparities. 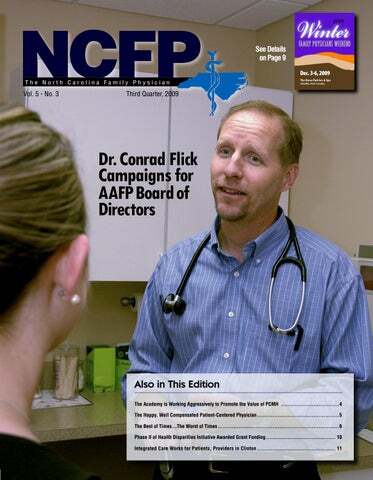 In Phase II of the Initiative which will begin this July, the NCAFP will extend the scope of the Initiative beyond their members and will engage other medical specialty associations in North Carolina, including the Buncombe County Medical Society, the Mecklenburg County Medical Society, the North Carolina Pediatric Society, the Old North State Medical Society and the North Carolina Academy of Physician Assistants. The NCAFP will provide educational sessions, tools related to the Culturally and Linguistically Appropriate Service Standards (CLAS) and assistance to these organizations in training their constituencies about implementing culturally appropriate services. If you would like more information about the NCAFP’s Health Disparities Initiative, please visit www.ncafp.com/home/programs/disparity. patient to the PCP for an immediate prescription, if needed. The patient leaves with the prescription in hand. In addition, Bauman points out that in a colocation, all patient records are kept in one place – a single file contains all primary and mental health care notes, streamlining the care process even further. While co-location has clear benefits for patients and PCPs, Walters says she appreciates the arrangement as much as anyone. “Co-location isn’t just beneficial – it’s becoming necessary,” she said. Walters notes that as insurance reimbursement rates for mental health services decrease and operating expenses rise, solo practitioners can’t afford to work alone. With co-location, Walters said, patients benefit from provider collaboration and providers are finding efficiencies in care that allow them to reduce or share cost burdens without detracting from patient care. By Peter Graber, MMC, CAE, Resident and Student Programs The NCAFP’s third-annual Family Medicine Day was a tremendous success when it was held in Durham on May 16th. Eighty (80) students from across the southeast attended the event’s activities that included a presentation by Dr. Lori Heim, AAFP President-Elect, 4-hours of skills workshops and a full recruiting fair. The Academy would like to thank the NC AHEC program for their continued support and generosity for helping to make this event a reality. Students from across the southeast participated in workshops This year’s event attracted taught by NC’s family medicine residency training programs. even more students and more family medicine program. Techniques presented included residency programs than in 2008. Family suturing, splinting and casting, shoulder and Medicine Day saw a dramatic increase in the knee exams and injections, perineal lacerations numbers of osteopathic medical students in and radiology reviews. Family Medicine Day attendance. Like the previous two years, out-ofconcluded with a two-hour recruiting fair that state students were plentiful, with some traveling gave each student the opportunity to meet with as far as southern Georgia to attend. each of the programs, make quality contacts and The theme for this year’s event was the interact with other medical students. Patient-Centered Medical Home (PCMH). Teaching faculty and Residency Coordinators AAFP President-Elect Dr. Lori Heim gave from all NC private and university-based students a comprehensive overview of the residencies attended. Residency Coordinators political environment, then went on to describe took the opportunity to meet and share ideas on how the PCMH model is so attractive. After the recruiting and program operations, as did the NC presentation and a brief Q & A period, students Residency Directors and the FMIG leadership. then proceeded to a series of four clinical skills The Academy will once again be hosting the event workshops. Each workshop was presented and in 2010. Look for additional information in the taught by physicians from each NC residency coming months. NC FMIGs to Present State Service Project This November The Family Medicine Interest Groups (FMIGs) in North Carolina are planning to present a statewide community service project highlighting family medicine. All four FMIGs have agreed to pursue a November blood drive on their respective campuses to promote the specialty and serve the community. The idea for the project originated from the NCAFP Student Section meeting in December, 2008. Leaders from each NC FMIG met in May during Family Medicine Day and agreed to pursue the project. Six NC Students Get Travel Awards to 2009 National Conference Six NC-based medical students were awarded travel scholarships to attend the 2009 AAFP National Conference in Kansas City this year. The scholarships provide a stipend that helps offset travel costs. The students and the scholarships they received are as follows: Christina Nisonger, First-Time Student Attendee; Haley Ringwood, First-Time Student Attendee; Jewell Carr, Minority Scholarship; Jillion Harris, Minority Scholarship; Nichole Johnson, FMIG Leadership; and Jennifer Parker, FMIG Leadership. programs and each other. North Carolina was well-represented, with members of each NC family medicine residency program in attendance. In addition to this event, North Carolina also had prime placement in the Conference’s exhibit hall. This location meant increased exposure to each program. Look for pictures and scenes from the Conference at www.ncafp.com. Call MAG Mutualâ&#x20AC;&#x2122;s Andy York toll-free at 1-888-892-5218 or Mike Tekely toll-free at 1-888-834-5940 today. www.magmutual.com Dividend payments are declared at the discretion of the MAG Mutual Insurance Company Board of Directors. of formal office visits. Most adults – 74 percent – would like to use e-mail to communicate directly with their doctor, but few have that option, according to a 2006 survey by the Wall Street Journal Online/Harris Interactive HealthCare Poll. Lack of compensation has been cited as a main barrier preventing physicians from more widely using electronic communication for patient interaction. The BCBSNC policy describes the circumstances under which providers can be reimbursed for an E-visit: •	When there is an established provider patient relationship based on a previous in-office visit. •	When the services are provided by a physician, physician’s assistant or nurse practitioner. •	When the extent of services provided includes at least a problem focused history and straight forward medical decision making as defined by the CPT manual. •	E-visits should not be billed more than once within seven days for the same episode of care or be related to an evaluation and management service performed within seven days. E-visit should not be billed within the post-operative period of a previously completed procedure. millions of patients annually í is slower to adapt. CDC Recommends HiB Booster Dose Reinstatement In late June, the US Centers for Disease Control and Prevention (CDC) recommended a return to the full Hib immunization series, including a booster dose for all children over 12 months of age. They also issued guidance on a phased approach to immunize toddlers whose booster dose was previously deferred. HiB has been in tight supply since December of 2007. Due to this, the CDC at the time recommended deferral of the booster dose to all but the highest risk children. It is expected that constrained supply of HiB vaccines will continue. All health-care providers are being advised to incorporate both ActHIB and Pentacel vaccines into their immunization schedules to ensure the latest CDC recommendations are followed and the greatest number of children are protected. Person-Centered Plans Now Require Signature A change in state Medicaid forms that began March 1, 2009 holds important significance to physicians and providers. Family Physicians are advised that you must SIGN the signature pages of the DMA Person Centered Plans AND YOU MUST CHECK the boxes indicating if you had direct contact with the patient and if you have reviewed the clinical assessment. Failure to comply can and will result in DHHS reporting the failure to the professional’s licensing board! Physicians are directed to download Medicaid’s Person-Centered Plans Manual [http://www.dhhs.state.nc.us/mhddsas/statspublications/ manualsforms/pcp/pcp_2008_instruction_manual.pdf ] to become familiar with this requirement. Pages 32-33 describe the Signatures and the intended notification to the licensing board for non-compliance. Members – please be sure to keep all of your contact info up to date. This includes your home and business address, phone, fax, and email address. To update, contact Tara Hinkle, NCAFP Membership Coordinator, at thinkle@ncafp.com, 919-833-2110. Medicaid Provider Verification and Credentialing Process to Begin This Summer As part of the Division of Medical Assistance’s move to a new information systems vendor, a process to verify the credentials of all Medicaid providers will begin this summer. This process results from the NC Department of Health and Human Services contract to CSC to develop and implement a replacement Medicaid Management Information System (MMIS). Previously, EDS served as the Information system vendor, and the state handled provider credentialing. However, under the new contract, CSC will credential providers as well as administer claims. While the claims process will not change until sometime in 2011, CSC is beginning the process to verify credentials now. Some providers may have already received notification beginning as early as June, and this process will continue for the next 12 months. The notification packet will be mailed to the provider’s billing/accounting address and will include a pre-printed report of information currently on file with NC Medicaid, plus a checklist of credentialing-related documents that must be returned to CSC. Providers may verify their billing/accounting address via the DMA Provider Services NPI and address database or by calling the EVC Call Center at 866-844-1113. Providers must complete the form, attach copies of documents required for credentialing, and return the verification packet to CSC within 30 days of the date of receipt or providers may face termination of Medicaid participation. The verification process will reportedly take up to three weeks from the time CSC receives the correct and complete verification packet from the provider. CSC will be responsible for reviewing the information and conducting credentialing activities that include criminal background checks, queries of practitioner databases and verification of licensure, certification and endorsement. Finally, beginning in August, 2009, CSC will be providing a web-based enrollment application for new applicants. CSC is looking for providers to pilot the new application in the summer. If interested, please email: ommiss. providerrelations@dhhs.nc.gov. For additional information about the transition of MMIS oversight to CSC, please visit www. dhhs.state.nc.us regularly for updates. Also, please feel free to contact Brent Hazelett (bhazelett@ncafp.com) with any questions. PATIENT-CENTERED MEDICAL HOME, continued from p.4 to being the right thing to do for our healthcare system -- PCMH certification as implemented will ultimately bring increased revenue to your office. NCAFP and AAFP together are lobbying Medicare and private insurers to increase reimbursement to PCMH certified offices either through the utilization of per member per month (PMPM) payments such as currently paid by our own Medicaid program or increased E&M payments on codes submitted by PCMH offices. To that effect, AAFP’s promotion efforts in conjunction with the TransforMED project, have asked Medicare to consider significant per member per month payments to practices that meet all the requirements for PCMH certification. Happy Physician, continued from p.5 Health of the Public Council and the NCAFP showed strong support for this bill. Within the next few months, changes in national health care policy will likely have an effect on all of our practices. It will be important to continue to participate in the process and evolution of health care as these changes are implemented. Family physicians should be front and center, because we are at the center of the solution to health care costs and quality. We have to continue to emphasize the need for an adequate physician workforce to meet the demands of patients. Family physicians need to be rewarded financially and recognized for their contributions to an improved system so that medical students will choose our specialty. Your Academy is actively pursuing ideas to improve interest and retention in family medicine. We are exploring programs to mentor students, pay off debt, and increase the esteem of our specialty choice. These efforts will be necessary to train and keep family physicians in areas where they are desperately needed. Do not sit on the sidelines. If your patients, practice, and profession are important to you then it is vital that your voice be heard. There are many ways you can contribute to being and advocate for Family Medicine. You can call or email you local legislator, sign up to be a NCAFP Key Contact, or you can send a check to NC FamPAC. You can even come to Advocacy meetings at the Academy (3rd Monday Nights) Call to verify dates. Please help us to help our patients by being a family medicine advocate. There are a number of ways you can make an impact. Charitable Giving … Helping the Future of Family Medicine As the financial needs of the NCAFP Foundation continue to grow, keeping pace financially is essential to continuing its many fine programs, such as the scholarships/loans it provides to medical students interested in family medicine, supporting our Family Medicine Interest Groups and delivering preventive health care programs like NC Tar Wars. These programs are why charitable giving to the Foundation in the form of planned giving is so important. Planned giving enables you to make a donation in a way that is tax-preferred to your individual needs and to those of your estate. By planning today and utilizing common forms of planned gifts (including charitable bequests, charitable remainder trusts and gifts of life insurance), you can make a future contribution to a very worthy cause. Often times gifts in these forms may benefit you and your estate by reducing your current and future income taxes, and in some instances, may also help reduce your final tax burden. Please be sure to visit your tax advisor or estate planner during your next annual review to learn more about your options. Once determined, you may then direct your gift to be used in any number of ways by the NCAFP/F. Please contact Kathryn Atkinson, Foundation Development Coordinator, for more information regarding charitable giving or other donations to the NCAFP Foundation. She can be reached by phone at (919) 833-2110 or 800-872-9482 (NC Only) or via email at katkinson@ncafp.com.